Hazard tree removal to begin mid-February. 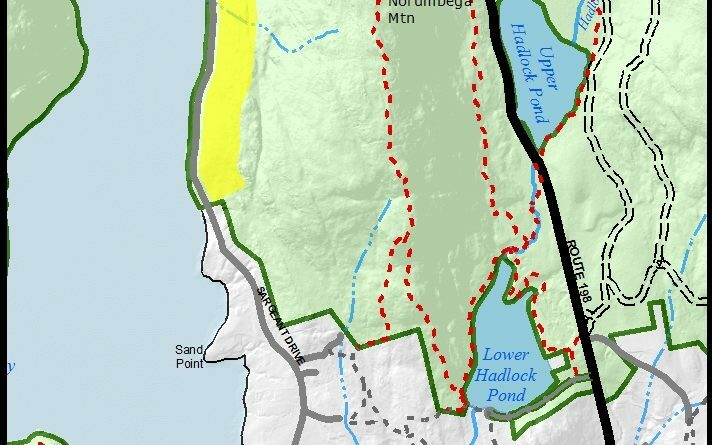 BAR HARBOR — Cutting of hazard trees in Acadia National Park along Sargeant Drive, Northeast Harbor, will occur 7 a.m.-5 p.m. Monday-Friday, mid-February through May 15, with traffic reduced to one lane occasionally when necessary. The primary focus of the work will be a 1.2-mile section of Sargeant Drive, between about 0.1 mile south of the Suminsby Park entrance and about 1 mile north of the Northeast Harbor Golf Club driveway, to remove trees that pose a risk to a person or property (e.g. power line and roadway). Acadia National Park conducts its larger tree cutting projects in the winter months, to avoid harming the Northern Long-Eared Bat, which was listed to the Endangered Species Act after its number declined significantly due to White Nose Syndrome. The bats use the trees in Acadia to roost and raise their young during the spring, summer, and fall months. Many of the trees to be removed in this area are dead red pines that have succumbed to red pine scale. Red pine scale on Mount Desert Island was first confirmed on Norumbega Mountain in 2014. In the past five years the infestation has spread throughout the mountain and along Sargeant Drive. Once red pine scale has been introduced to an area, little can be done to manage its damage. The spread of red pine scale can best be limited by not transporting any part of an infected tree, and by leaving the felled tree in place to decay naturally. That will be the policy adopted along Sargeant Drive. It should be noted that such a strategy does not increase fire hazard, and most of the dead red pines have lost their needles and smaller twigs. The remaining, bulkier trunks do not carry fire well. And, the rapid decomposition rate, high summer soil moisture, and the high humidity of coastal Maine further reduce fire danger. This hazard tree cutting project is funded through entrance fees to Acadia National Park and the work is being completed under federal contract with Thompson Timber, Orford, N.H. Contact Daniel Meggison, Facilities Project Manager, Acadia National Park at 288-8767 or daniel_meggison@nps.gov if you have questions regarding this work.